The Arc de Triomphe is huge. You can reach it from the Champs Élysées at the intersection with the Grand Palais. If you think it's just a short walk, think again. It probably takes a solid hour to get there. The walk up the Champs Élysées is indeed pleasant but I'd recommend doing it first thing in the morning, especially in summer. You access Arc de Triomphe via a tunnel that goes under the road and leaves you in the square. This is the only way in. 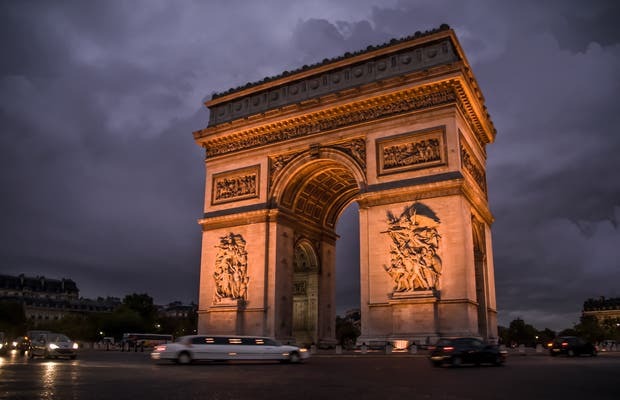 The Arc de Triomphe in the Place de l'Etoile is one of the most iconic places in the French capital. Basically, this is a monument to the French people. On the sides, there are allegories about the French Revolution, like the famous Marseillaise. Inside, the walls are covered in the names of generals who lost their lives in various wars. The Tomb of the Unknown Soldier with its eternal flame is the final addition. On the champs Elysée. If you want to go up the line is usually short (30min wait). The view is impressive ! You can go and walk on the roundabout. Everyday at 6pm there is a memorial for the unknow soldier. You should definitely watch that! The orange sun gave it a different hue and we got amazing pictures clicked. The entire area is really nice to take a stroll. Very nice park, you should go there. Busy traffic all round, doesn’t matter what time. Para poder estar debajo debes pasar por un túnel.